Authentic change isn’t something that happens for a season; it’s a commitment to undoing a habit or hang up that has subtly crept in and become part of how we do life. We trudge ahead in blissful ignorance until one day when we realize our clothes don’t fit, the kids are about to go to college, our marriage is almost over, or we can’t think clearly without that first sip of alcohol. But what if we decided to change before we have to instead of because we have to? 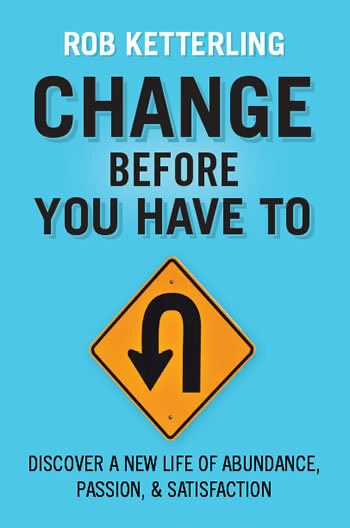 Through Change Before You Have To, Rob Ketterling empowers readers to embrace the opportunity today to live a life that is full of abundance, passion, and satisfaction. As Rob learned firsthand, the perfect time to make a change is now! Only then will we fully experience the life God wants for us. Rob Ketterling is the founder and lead pastor of River Valley Church, a multisite church started in Minnesota in 1995 and has since grown into a thriving church with over 7,500 in attendance across eight U.S. campuses and two international campuses (Valencia, Spain and Mbekelweni, Swaziland) with plans for further expansion in the future. Rob serves on several church and para-church boards, the Board of Regents at North Central University in Minneapolis, Minnesota, and is on the lead team of the Association of Related Churches (ARC). He is the author of Change Before You Have To, Thrill Sequence, and Front-Row Leadership. Rob and his wife, Becca, live in Minnesota with their two boys, Connor and Logan.